Research articles tend to be strewn across many pages and take a very long time to read. The Academic Poster is only one page long and, to read one, takes no time at all. Research articles have no pictures, although they may sometimes include a table of data. The Academic Poster is visually appealing, even eye-catching and is in colour. Just the sort of thing if you want to present your research at a conference, or an academic convention, or even to very busy colleagues who don't have a very long time to read many many pages. The Academic Poster I have made presents someone else's research. 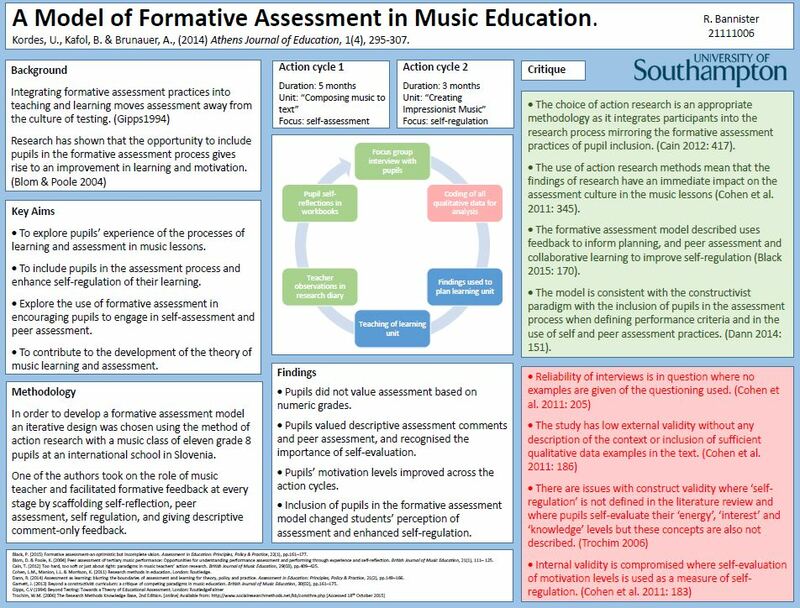 It is called Model of Formative Assessment in Music Education. It views assessment as a cyclical process that feeds back into teaching. It views assessment as a Learning and Teaching activity that actively involves pupils. It seeks to provide positive evidence to support this view of assessment. This Academic Poster is not your usual Academic Poster because I have been critical. It is not usual to criticize your own research. But this is someone else's research. So I have also included a critique of the research design When designing my own research I try to include all the good features I have identified in the critique. And I try to avoid the bad ones.